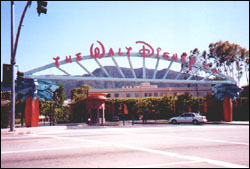 The Walt Disney Studios, is where many animation, and live-action productions are created for the Walt Disney Company. Originally built in 1940, at 500 Buena Vista Street, Burbank, CA, the studio covers about 44 acres. The lot originally contained many buildings for indoor sets, animation, sound recording stages, offices, etc. After Walt Disney’s success of The Alice Comedies, Walt bought property on Hyperion Avenue in the Silver Lake District of Los Angeles. This simple studio was a one-story white stucco building on a 60′ x 40′ lot. The inside of the building was open, filled with animators, inkers and painters. There was only a small partition separating Walt and Roy’s offices from the rest of the building. Beside the new studio being added to Walt’s business life, something else was added to Walt. Walt worried that his youthful appearance might be a drawback on his dealings in the movie-world. When he and a few other animators grew mustaches on a bet, he was pleased with his new look of maturity and kept it. In the late 30s, early 40s, the Walt Disney Studio was busier than a ever. With three features, and the regular amount of short cartoons in production, the Hyperion studio was filled to its limit. Animation crews were relocated to rented buildings all over Los Angeles. Luxuries at the new studio would include a streamlined animation center, it’s own telephone lines, fire hydrants, and it’s own roads. Walt wanted the Burbank studio to be a workers paradise, with large lawns, with baseball and volleyball courts too. 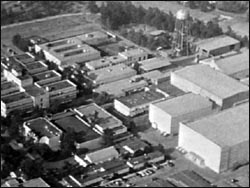 The Studios circa 1954Various parts of the Burbank studio were finished in 1939. Everything was finally finished by the spring of 1940. The Disney Studios circa 1950s. © DisneyWhen Disneyland was under construction in 1954, many pieces were assembled at the studio, and shipped to Disneyland. The Mark Twain was built inside stage 2, one of those large buildings on the right (above photo). As Disneyland became popular the Disneyland operation moved to Glendale. As Walt Disney Productions continued to prosper, so did the studio. When live-action films and television programs provided much success for the company, backlot sets were created. There were sets that looked like old western towns, mid-west small towns, houses, city’s, and more. All these were hidden from the public by a large berm. Many of the “backlot” sets have been destroyed to make way for office space. Recent construction includes the new Feature Animation Building, and Administration buildings. 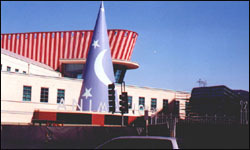 Walt Disney Feature Animation was moved across the street, on Riverside Drive. Also, since the Disney purchased ABC, a new ABC building is being constructed near the new Animation department. Since both these buildings are across from the studio, a bridge is spanning over Riverside Drive to link the two together. 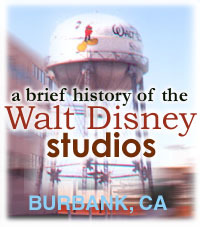 The Walt Disney Studio, in Burbank, is literally where the magic is made. Those art-deco buildings have seen films such as “20,000 Leagues Under the Sea,” to Mary Poppins. Housed peices of Disneyland, and filmed famous television shows like Zorro, and Walt Disney Presents. The studio has had a wonderful 60 years of service, and was well worth Walt Disney’s money. Let’s hope it stays that way.